Total Fight Challenge returns to the Willow Brook Ballroom on March 23, featuring two title fights. This is an all-ages event. For tickets, call (773) 582-9106 or The Willow Brook Ballroom at (708) 839-1000. 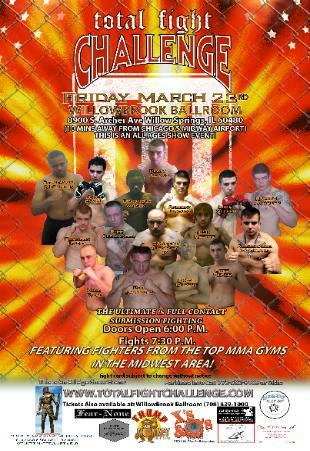 Come Friday March,23 I’m gonna make Mike Killeen never want to fight me again. Blessed is he who has found his work; let him ask few other blessedness. If there is anything that a guy are able to do well, I have faith that let him take action. Supply him with a chance. Mike Killeen days are running short..March 23rd is da day people will see how great i am.! Id like to thank my opponent for taking the fight on such short notice and with a large weight difference. You are a warrior for doing so. I am sorry I did not touch gloves as the bell rang, I will not be touching gloves in any fights once the bell has rung. Too often I have seen people get cheap shotted afterwards. Thank you for giving me the opportunity to fight after months of training.